During rainy weather in Atlanta, the biggest concern is drainage and grading in your yard. You can prevent these concerns when you contact landscaping experts to figure out how to cut down on the drainage and grading issues on your landscape. If your lawn has a drainage problem, then it can cause serious damage to your home and the yard. For further information on our landscaping services and how to prevent those drainage issues, reach out to Michaelangelo’s Sustainable Landscape & Design Group. Drainage is important if it’s the proper kind, after all its water that will help your landscape. However, it can turn very serious if it’s the improper type of drainage, and it can substantially damage your landscape if there’s poor elevation on your property or the grading is poor. 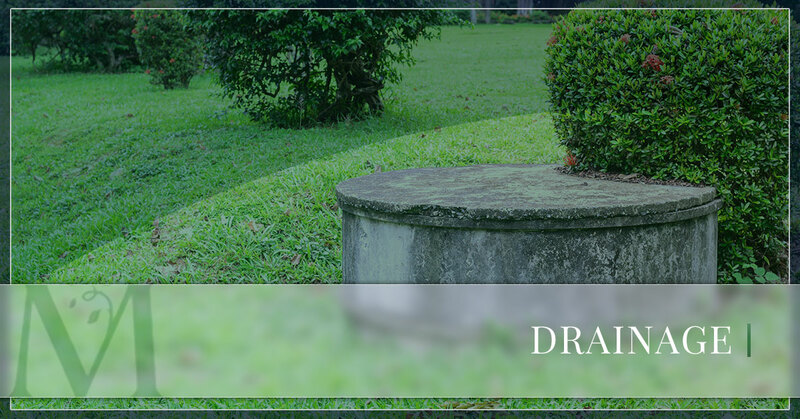 Good drainage contributes to a beautiful lawn and is an important factor in the design of the landscape. Water is important for a healthy landscape and it can prevent those pesky issues from occurring, but it can also cause some serious damage. If you’re having drainage issues, then you’ll need something to stop the water from moving downward. Our landscaping professionals can help you create a way to control the drainage to stop it from ruining your yard. Dry Creek Beds: This soothing and natural garden feature can help to control the drainage and it will add a tranquil factor to your landscape. Downspouts: This will help to move the drainage with a pipe. Simple, effective, and efficient, any water on your property will be taken care of. Drainage Basins: Drain the area of your yard where the water collects into a common outlet that doesn’t damage your landscape. Drainage Walkaways: This method will eliminate the water in your landscape by moving the water from potentially damaging your yard.